After visiting the Orchid Show (purchase tickets here), you may be inspired to try growing an orchid in your home, but for the new orchid grower, selecting an orchid may seem overwhelming. Here are a few tips to get you started. A healthy orchid. Notice the plump pseudobulbs (stems), smooth green leaves, and beautiful flowers. If you look closely, you’ll even see new buds forming. 1. Know yourself, your growing environment, and what you’re buying. Orchids live in a wide variety of habitats and come in a wide variety of sizes, so you’ll want to make sure that you choose one that’s well suited to your home and to your schedule. 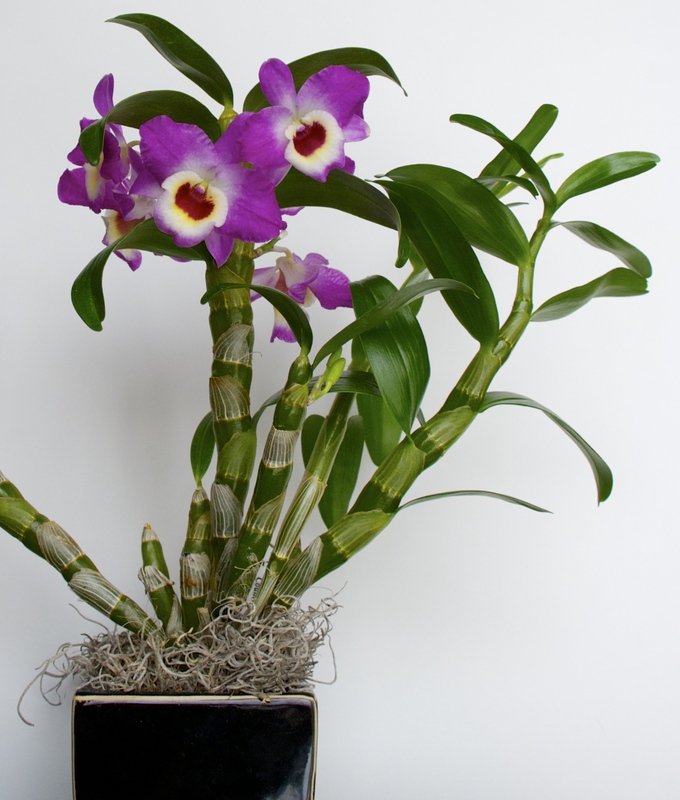 For example: if you have lots of bright, direct sun in your home, a Cattleya will do very well, but a Phalaenopsis may struggle. If you have questions about an orchid’s growing conditions, you can always ask the grower you’re buying from, or check out the American Orchid Society’s Culture Sheets. Also, make sure that your plant has a tag identifying it, or that you get its name and put a tag in the pot right away. There are thousands of orchid species and hybrids, and often it’s difficult to identify a plant on the flower alone. Having a tag will help you to always remember what species or hybrid your orchid is. 2. Choose a plant you really like. This may sound obvious, but orchids aren’t like other house plants. Most only flower once a year so you will probably need some good motivation to keep caring for it when it’s not in flower. Also, sometimes the shock of moving from the greenhouse to your house will cause orchids to skip a year in flowering. Don’t lose all hope though! There are some orchids that flower continuously for most of the year, and others from which you can get multiple flowerings in a year. 3. Only buy a healthy plant. 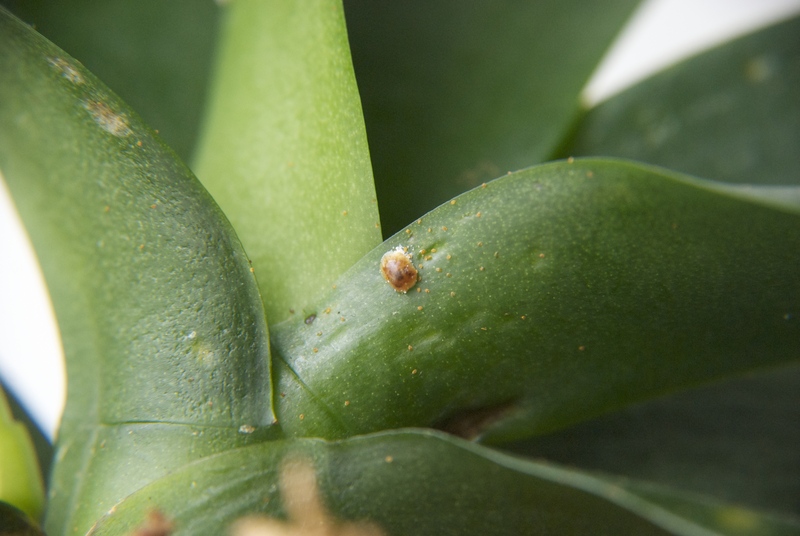 Soft brown scale (Coccus hesperidum) and offspring on Phalaenopsis. The easiest way to tell if a plant is healthy is to look at it. It should have smooth green leaves, fleshy, plump pseudobulbs (if present), and no bugs. Discoloration and spotting of the leaves may be due to cultural conditions, but it may also be a sign that the plant has a virus. Unlike people, orchids don’t recover from viruses. Like people, however, they can spread the virus to other plants in and around your home. Leaf pitting, scaring, and holes also may be cultural, but more likely are an indication of bugs. Bugs are small and can be difficult to spot. Some examples are soft brown scale and the longtailed mealybug. These bugs are quite common and quite difficult to get rid of once you have them. They survive by feeding on the sap of the plant, sucking away its life and leaving behind ugly marks. Although the adult bugs are usually easy to spot, the juveniles are easy to miss because they’re tiny and hard to see. 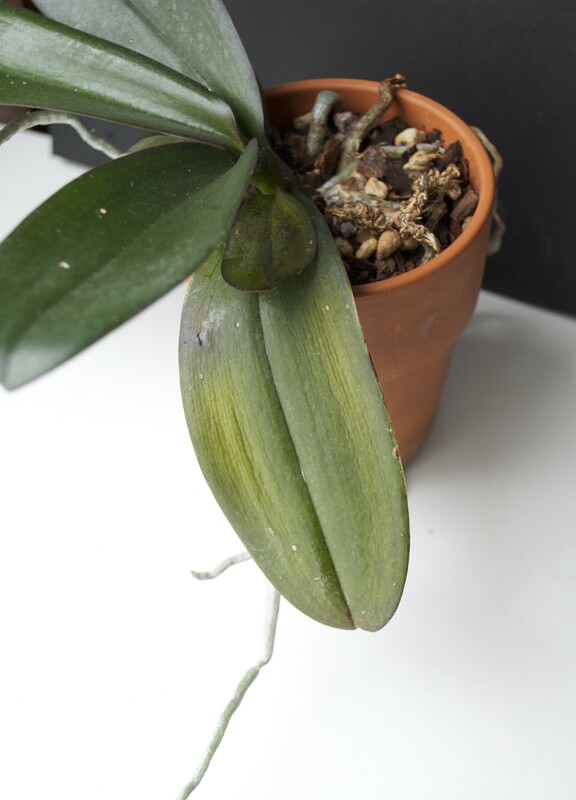 Yellowing and pitted leaves are signs of the stress this orchid is suffering because of a scale infection. 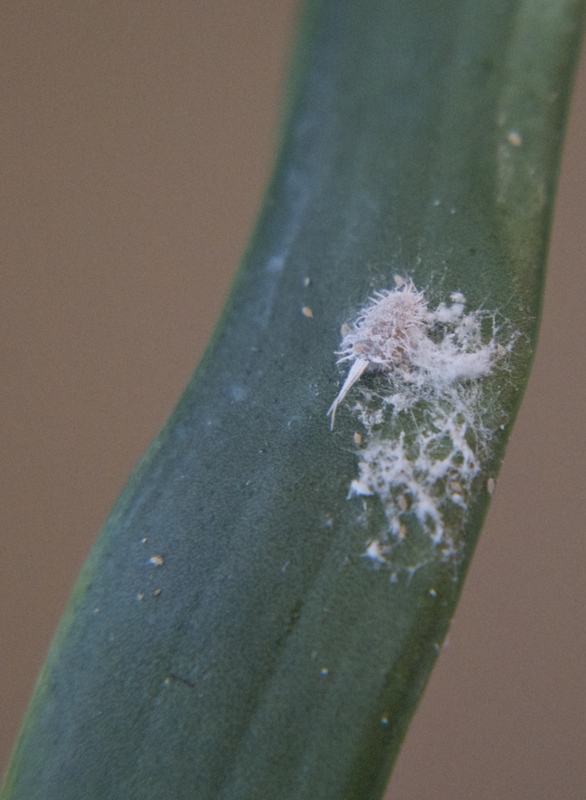 Close-up of an adult longtailed mealybug with offspring. You have basically two choices when buying an orchid: buy one that’s flowering or about to flower, or buy one that’s not in flower. Especially for the beginning grower, buying orchids in flower is often the better choice. The biggest reason is that you get to see your orchid flower at least once. People who grow orchids will readily tell you about how many they’ve killed—it’s just part of the learning process. If you buy your plants in flower and they die, it’s not really any worse than buying a bouquet of cut flowers. (Orchids are about the same price, and the flowers last much longer.) Another reason to buy when the plant is flowering is so that you can be sure that you like the flower, and that it has no abnormalities that you find unattractive. 5. Look for new growth. This is an indication that the plant is doing well and will continue to do well. Often, next year’s flowers come from this year’s growth, so if there’s no growth, there may also be no blooms. You can find new growth in two ways: new leaves or green tips on the roots. Roots sticking out of the pot are no problem and are the easiest to check. Find an orchid at the Orchid Marketplace, open weekends throughout the Orchid Show.